The legendary skater, Richard Dwyer, sat with Susan Austin and Randy Gardner for an informal Question and Answer session recently in Burbank, California at the Pickwic k Ice Arena. Mr. Dwyer’s fame as “Mr. 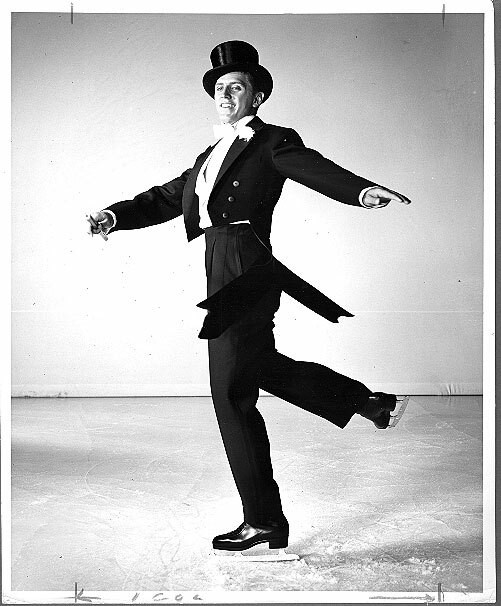 Debonair” in Ice Follies and later in Ice Capades made him one of the most popular ice show personalities in history. He inherited the role from Roy Shipstad when he was only 14 years old. Shipstad trained and taught him the number, but they had to rename the role as, “The Young Debonair” and the “Dywer Girls” were taller than he was at the time. Mr. Dwyer says of Shipstad, “He is a great mentor and a great friend.” And, we all remember his pair skating years with Susie Berens. They always brought a smile to everyone’s face. Randy: When did you start with Susan Berens? Richard: In 1967. She didn’t skate the 1968 Olympics. 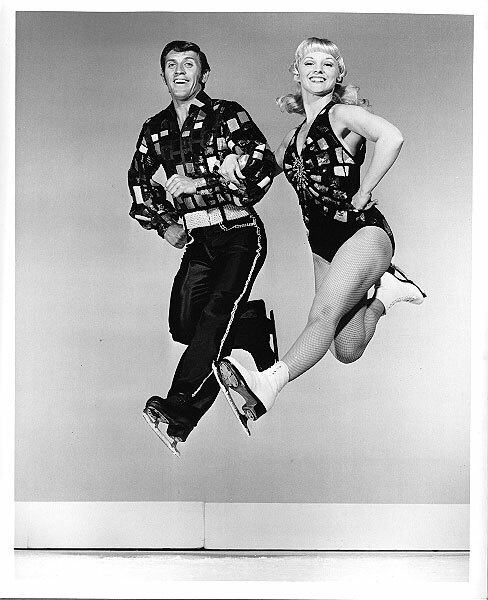 Bob and Helen Maxim, the Ice Follies choreographers, brought her in both as a soloist and to skate pairs. Dorothy Ann Nelson, my partner before Susie, had been there 5 years and she got married and decided to retire. They were scouting and on the way home they brought Susie into Minneapolis. Her mother, Betty, competed when I did. I had known her forever. She came in and we skated that night. We had skated about a half hour and she said. “Let’s try a double twist.” Well, I had never done a double twist; “What do you mean?” And she said, “well, there is nothing to it.” And then boom, she almost did it by herself. She had skated pairs and she and her partner were 3rd or 4th in the world. Randy: Had you done pairs? 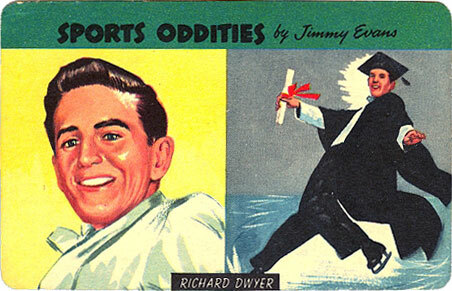 Richard: Yes in 1951. 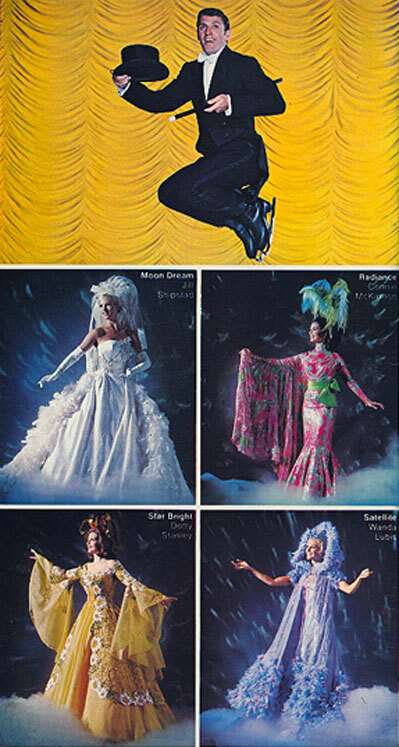 I had 13 partners while in Ice Follies. At one point, I got to skate with Barbara Wagner. That was great fun, delightful. Susan: What inspired you to start skating initially? Richard: My Dad was from Nebraska and my mother was from Illinois. My father skated as a kid in the back yard. His dad was with the railroad and he had 5 children. They flooded the yard and skated. That was his memory. His father died when he was 8 and left a family of 5 kids. My grandmother eventually moved the family to Oregon. They came to California in 1913, to Petaluma and then to here to Los Angeles. We went to Follies in 1943, the whole family, and that’s when dad decided he would take his kids skating. We went skating for the first time at Christmas at the Pan Pacif ic. He took my brother, Ronald, more often than he did Delores, my sister, and me. But we kept bugging him until we used to go every Friday night to the Pan Pacific. Delores and Ronald gave up skating almost immediately. My mother even skated about 4 or 5 times, but took one spill and that was it. Susan: What made you to decide to turn professional? 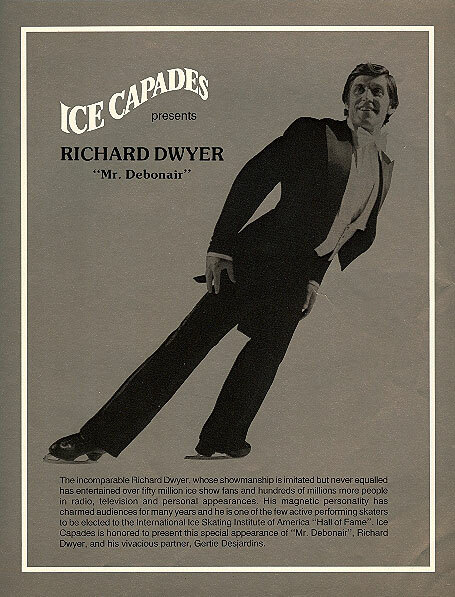 Richard: I skated in a lot of shows in Chicago, the Rotary club in Seattle, in Vancouver. I was best friends with the Shipstad kids. 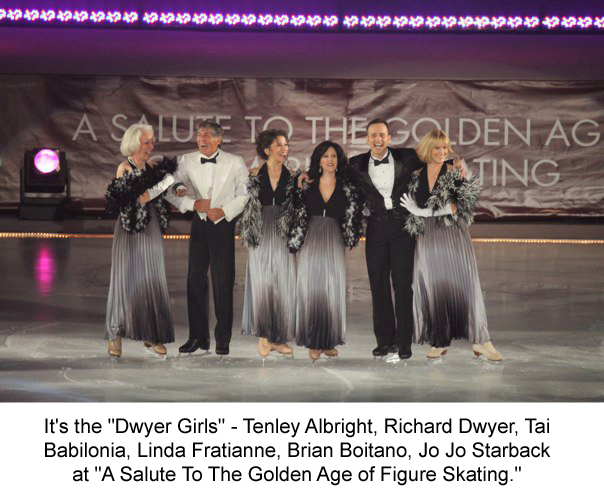 We all skated in Westwood, California at the Sonja Henie Rink in the summer of 1945 and it was a big thrill! Shipstads and Johnson made me an offer immediately after the 1950 Nationals in Washington. I was 14 years old! “We want Richard to come in and be Roy Shipstad’s heir apparent because he had quit.” He was the original Mr. Debonair. But, my reaction was “no,” I didn’t want to go, I was all into the amateur. But it was a different area. And you know Ozzie and Harriet Nelson? Their kids skated at Polar Palace and they said “Oh, you should go pro” and different people said, “Go and become a performer.” So, I took their advice. 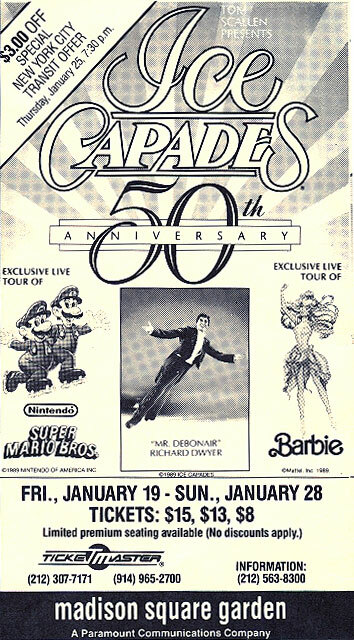 Ice shows were big then. Amateur skating was big, but it wasn’t getting the coverage. So, that’s how it happened. Randy: Did you know Sonja? Richard: Yes, I first met her out at the ice rink in Westwood when I was just a little guy. I just shook her hand and that was it. We all watched her and talked to her. Over the years I saw her from time to time and she would always say, “Richard, you know you learned to skate at my rink” at the Westwood Ice Gardens. 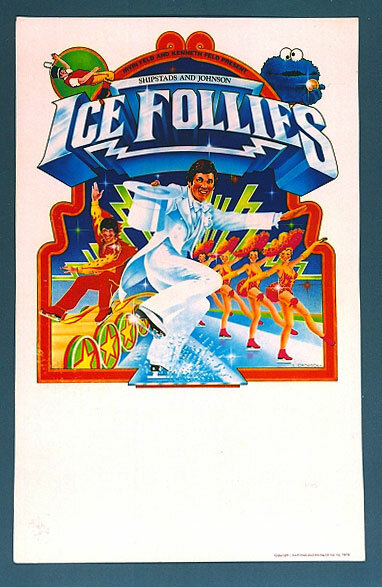 One of the funny incidents was when I skated with Dorothy Ann, which would have been in the 60’s, Sonja came to the show and sat in the front row. Well, do you remember the Swing Waltz with all the couples? It was eight couples and when they went around the audience would applaud for the couple they liked the most. When we went skating by Sonja she would clap and clap and say, ‘Bravo, Bravo!’ I got so excited that I stubbed my toe and fell! Through the years, I saw her in restaurants a couple of times in NY like the El Morocco and again in Beverly Hills where one of her dinner guests was Jack Warner of Warner Bros. Studios. She waved hello. Susan: Did you have a stint in the U.S. Army? Richard: Yes, 1958. I was 23 yrs. old. I signed up in the Valley for the army reserve. I had to do 6 months active duty, so I went to Fort Rod for six months. It’s now a college, but then it was a big army camp. I was there 6 months; I was a private, an unglamorous lifestyle. Then they assigned me to the control group which meant that you had to go to summer camp for 2 weeks. I didn’t skate for the 6 months. I went right back to Follies and made that season’s opening. When the Berlin Wall went up, under Kennedy in 1961, I was called up again from the reserves. Anybody in the control groups got called first. So, we were in Detroit when my mother called and said you just got papers. To confirm it, I called the headquarters to check. The woman on the phone said, ”Private Dwyer” yes, you are going back. I had no choice. So, I left again in December of ’61. Actually I got called in October, and Oscar Johnson immediately wrote this letter to the west coast and said that we can’t replace him in 2 weeks, but we will have him ready in a month. They were trying to figure out who to put in, and they went with Jill Shipstad. They made Jill a ‘Debonair’ as a tribute to her dad. It worked, but it was not easy for her because they had her in tails, with a short skirt. Here is this glamorous girl coming out with a bow tie. It was cute. I helped her as much as I could and they wanted to keep the other girls because they had all that money in the costumes — thousands of dollars. It wasn’t as natural for a girl, but they worked on it and changed it around a little bit and it worked out. After my 10 months I came back to the show. That’s when they signed up Dorothy Ann Nelson. Randy: What was your schooling like? Richard: You know, I went to 26 high schools. That was most unique. I went to the Jesuit High Schools and where there wasn’t one in a particular city, I went to the Christian Brother. My mother just didn’t get into skating. She got me to the rink and was nervous when I performed. She wanted to make sure that I went to school, so she traveled with me. I went to Loyola High here (in Los Angeles) every morning, and would go do the show at night. At that time we would do two on Saturday and two on Sunday until the 3rd year and then we started doing the threes. I went to Regis in Denver, then another school in Omaha the next week, then another in Chicago, so on and so on. Loyola High School set it all up. That’s why I owe the Jesuits a lot! I attended each school two to three (sometimes four) weeks at a time. In those days they played longer runs in the shows. Susan: Did the curriculum link up? Richard: Yes, the Jesuits were pretty good educators. They have 3 divisions in the US. They followed a syllabus. So, I would go in and talk to the principal and tell him where I left off in Latin, for example, and they would put me in a class that they thought that I could adapt to. I made a lot of friends in all those different cities. Susan: In 1993, you were inducted into the U.S. Figure Skating Hall of Fame. What was that like? Richard: LA Figure Skating Club requested they do it here. They did a show. Gene Turner could come, and they knew he coached me. A lot of my friends were there. So, it was nice. I never got to go to the celebrity of the Nationals. But, the Pickwick Ice Arena was great. Even Eddie Shipstad came. Randy: I remember when you were the manager at the Wollman Rink in Central Park. Richard: Yes, that was fun. We did Monday night shows for NY Times Magazine, IBM, and just fun stuff. They would have a party and we would do a 20 minute show. I set up the parties as that was part of my duties. I had to meet all these people. It was interesting, the different personalities. Some were black tie, some were casual. It was an exciting time. I loved NY. Susan: When were you in Hong Kong? Richard: Ted Wilson invited me there. I think it was around 1985. We went over and did the show with Dorothy Hamill. Gerty and I and Dorothy’s corps boys along with Tim Murphy and Nathan Birch. Those were fun shows. We did them at that mall. Ted was theatrical and liked putting on those shows. He had me over there again two years ago to open a new rink. Susan: What was teaching in Dubai like? Richard: We went there when it was almost new, only four or five big hotels, They were quick-rich from the oil business. There was no drinking, it was strict, but some hotels did have bars. The women never got to come out from under their veils. It was a strictly man’s world. It was so obvious. But the expatriats, and that’s whose kids we were teaching, were from England, Switzerland, Germany, France. All the Dads were helping to develop new industries. I was there when they built that first golf course. The developer’s two daughters skated. We did shows. That was the main thing. That one summer Ted Wilson, the rink manager, said, ‘You could make some money.’ “What do I have to do?”, I said. “Teach 12 hours a day?” Well, I almost did. My feet died after that summer. Susan: Why do you think the big production shows come to an end? Richard: I was there. I saw the audiences falling off. I just think when the prices went up and skating started getting exposed more and more, it just started falling off. We were still making a little money. I was company manager and we were doing okay. We weren’t losing money. But, then Kenneth and Irving Feld came in and that was the end of our show. And, of course, Kenneth has made millions. But, I like the old theme of having stars and ensemble and people to be known for who they are — where you don’t wonder who played Cinderella. That’s hard for me, but they are making money. Susan: What would be your dream ice show now? Richard: Well, I’m stuck in the past, I’m embarrassed to say but I’d go see an all star show. Randy: I remember when Tai and I did an Ice Capades engagement with you in Minneapolis. All the attention was on you. The audiences loved you and couldn’t get enough! Richard: Well, I had a following of 30 years. I was the kid that grew up with them. I love the production. I love the glamour. I just feel it could come back. I still go to musicals and get turned on and love it. It is just so expensive to troupe an ice show with the trucks and the amount of people. You know, people say to me, “You have been here forever, how do you feel?” And, I would say that it’s just an honor to still be here and skate.